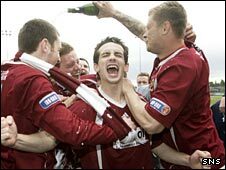 Stenhousemuir earned promotion to the Second Division after a penalty shoot-out with Cowdenbeath at Ochilview. With the tie poised at 0-0 from the first leg, neither side could break the deadlock after 120 minutes of football. Stenny netted all five spot-kicks in the shoot-out with Cowden's Jay Stein missing the visitors' third. John Booth kept Cowden's hopes alive, but Stenny's Andy Brand stepped up and made no mistake to seal Second Division football for the first time since 2004. It meant heartbreak for Cowdenbeath, who led Division Three for much of the season only to be overtaken by eventual champions Dumbarton and to finish second. But Stenny, who finished fourth, had beaten Cowden in three of their four league meetings this season and went into Saturday's game as slight favourites after holding out for a draw in Fife in midweek. The closest either came to scoring in the second leg was when Stenhousemuir's John Ovenstone smashed a shot off the crossbar. While the hosts would have been delighted to secure promotion after a long absence from the higher division, it was tough on a Cowdenbeath side who finished the regular season seven points better off than their rivals. "That's what all the work has been about over the course of the season. "I'm absolutely delighted that we managed to get it. We kind of fell over the line in the end, but nonetheless we got there, and I'm absolutely delighted. "I thought Cowdenbeath were the better side on the day, but we had to hang in there and work really hard. "Fortunately for us, we got a break with the penalty miss. "It can't get any better for me. This is what's it's all about - the highs outweigh the lows - it's a fantastic feeling to be where we are just now." Stenhousemuir: Bennett, Lyle, Ovenstone, Thom, Smith, Reid, ove (Iain Thomson 64), Molloy, Dalziel (Brand 112), Diack, Motion (Brazil 64). Subs Not Used: Renton, Stirling. Cowdenbeath: Hay, Baxter, Mbu, Robertson, Armstrong, Shields (Fleming 119), Ramsay, McQuade (Tomana 93), Gemmell, Dempster (Ferguson 95), Stein. Subs Not Used: Jackson, Linton.